How do you start a community supper in an area that is fortunate to have so many? 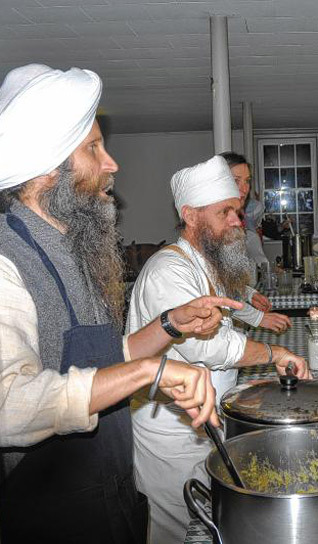 That’s the question Saibhung Kaur, and her husband, Saibhung Singh, were trying to answer when their friend, Balmeet Kaur, said the way to begin is with a gratitude supper for the long-time community supper organizers. The dinner was held Friday, November 20, 2015 in New Hampshire, USA, at the Peterborough Unitarian Universalist Church with organizers in attendance from the Unitarian Church, Hancock, the United Church of Jaffrey and Peterborough’s Union Congregational Church, United Church of Christ. Chris Mann of the Peterborough Food Pantry was there too. Langar has a long history in the Sikh faith, explains Nirankar Kaur. Begun by Guru Nanak in the 1400s in Punjab to bring Muslims and Hindus together, the langar is a free meal shared traditionally by people sitting on the floor. Music was also part of Friday’s gratitude supper. Saibhung Kaur and Saibhung Singh have been offering kirtan, devotional singing that involves call and response, the third Friday of every month at the Unitarian Church for a number of years and have wanted to add a langar for some time. Saibhung Singh said he and his wife, Saibhung Kaur, joined the Peterborough Unitarian Universalist Church and began singing at the church every month a handful or more years ago. They then found a “new way of being” two years ago, and continued to offer kirtan at the church. “We became Sikh, but this idea of doing music and food together has been brewing for a long time,” he said. The inspiration for the new supper in Peterborough also came from the many organizers of community suppers already in place. “From the bottom of my heart, I thank you,” he said. The group plans to continue the suppers for the general public the third Friday in January for a trial period of six months, to be followed by Kirtan. The first one Friday gave organizers a chance to try it out. “The idea is we trial our process and we learn from theirs,” said Nirankar Kaur, referring to the long-time organizers. The community supper organizers agreed Friday night to continue meeting and sharing tips and ideas. “We’re more of a spiritual path, than a religion,” Nirankar Kaur said, noting people in the Sikh community of about 75 people in the area are at various stages in their path. 1: Ajit Singh Batra (Pennsville, New Jersey, USA), November 26, 2015, 8:55 PM. Saibhung Singh and Saibhung Kaur are living as God-conscious persons. They perform devotional kirtan and serve langar to the sangat of the area. To love God and to serve humanity is every Sikh's life mission.